This summer, surprise your guests with this Cream Tart Cake! Inspired by number cakes, it’s baked in the shape of a star, so it’s perfect for Memorial Day, 4th of July, or any red, white, and blue-themed summer BBQ! 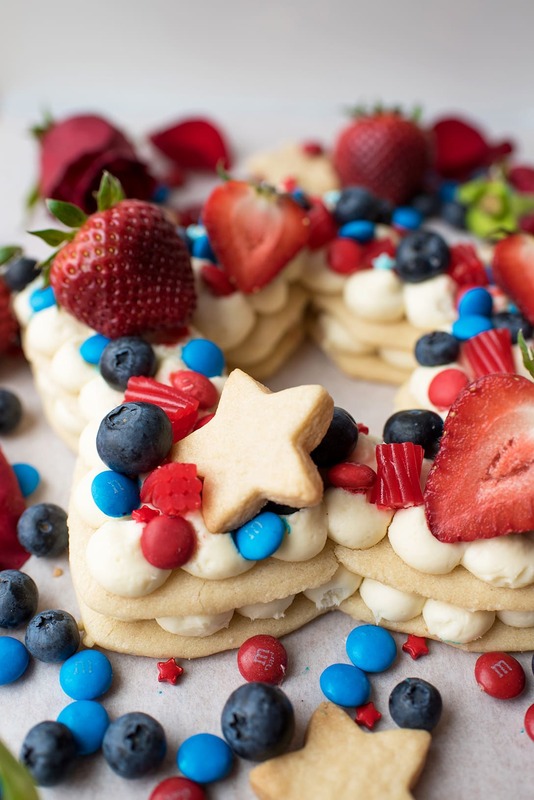 Looking for other patriotic dessert recipes? 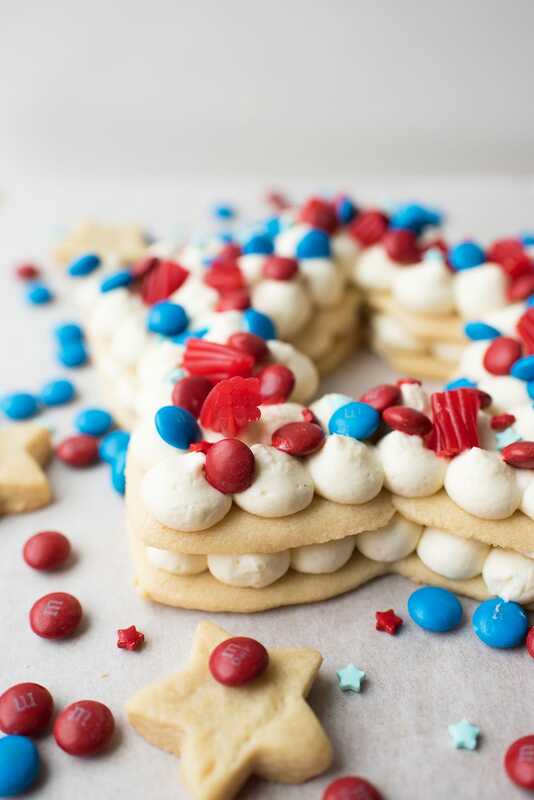 Check out this Red White and Blue Candy Bark! What are Cream Tart Cakes? Cream tart cakes aren’t really cakes at all, though. They’re two cookies separated by a layer of pastry cream or frosting. More pastry cream is piped on top and then they’re decorated with everything from candies and smaller cookies to flowers, chocolates, and macarons. The “cakes” were invented by Adi Klingofer, a pastry artist based in Israel and around the beginning of 2018, started to take over Instagram. Soon, bakers all over the world were creating their own versions. Over the last year, you might have noticed that I’ve been talking about Ralphs and Kroger in some of my posts. That’s because they hired me to be one of their ambassadors! I feel so lucky and grateful for this opportunity as not only does it help me continue to bring you content, it also means I get to work directly with a brand that I think it is doing a lot of great things. For instance, I’m especially floored by their Zero Hunger Zero Waste initiative. By 2025, their goal is to donate 3 billion meals and achieve Zero Food Waste throughout their stores and within their production channels. To see a huge brand put so much energy into sustainability and make serious strides to end hunger with local communities is really heartening. I’ll be dedicating a whole post to talking about this soon because I think it’s really important. 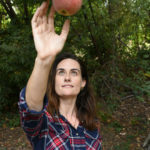 In the meantime, I’d love to hear your ideas about how you’re cutting down on food waste at home or where you struggle. In May, I got to go back to the Midwest (I’m a Detroit girl at heart) as Kroger flew me to their headquarters in Cincinnati to take part in their annual Kroger Influencer Council (KIC) Think Tank and help create a Red White and BBQ themed dinner! While there, I got to meet so many other bloggers and influencers and found out all about Kroger’s new initiatives and some products that are hitting stores later this year. Now, I know as a baker, I’m supposed to mostly be geek about the sweet stuff – and don’t get me wrong the Kroger Deluxe Sweet Cream Funnel Cake Ice Cream looks amazeballs and the sparkling coconut water seltzer is delicious ­– but seriously, I want all the bags of Nashville Style Kettle Cooked Hot Chicken Potato Chips in my house. Like, now. And, if they eventually do get over to SoCal (hint hint), I’ll add them to my ClickList, Kroger’s online shopping tool. You add all the products you would like to purchase online, add them to your cart, and then drive to the store! When you get there, all of your groceries are bagged and ready to go. For the dessert portion of the Red White and Barbecue cookoff, Sarah from Broma Bakery, Jasmine of Jazzy Things, and I got to bake our summer-themed desserts in the enormous industrial kitchen! The space reminded me of when I staged briefly in the pastry kitchen at Suzanne Goin’s Tavern. I love my home kitchen, but my eyes went into full saucer emoji heart eyes mode when I walked into the kitchen and saw those ovens and fridges and mixers. Sarah baked these delightful blueberry and strawberry star-shaped hand pies, Jasmine made a delicious almond cake with mascarpone frosting and roasted strawberries. I sort of kept eating those roasted berries off her tray once she was done with them because they were so good! And, I made a Star-Shaped Cream Tart Cake. I wanted to create it to show you that even though it’s a total showstopper, it’s not hard at all. It’s also a great way to use up any leftover berries, candy, or sprinkles! Click here for more Red, White, and Barbecue recipes and ideas. Roll out your dough between two layers of parchment and place the parchment on a baking sheet. Below I’m showing you two sizes of tarts. You need two identical baked cookies for each tart. Remove the excess dough and reroll it for more cookies or roll into a disc, wrap in plastic, and save for future cookies. 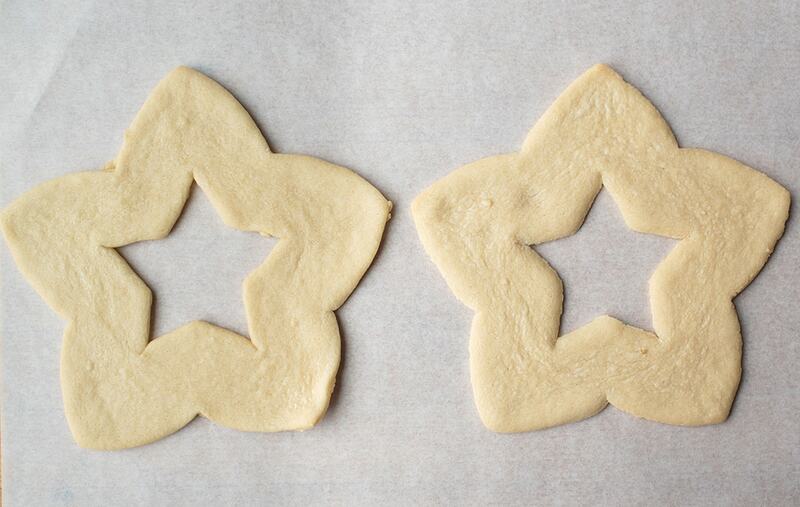 Remove the cookie cutters and bake at 350° F for 12 minutes or until edges are just a very light golden brown. Pipe cream frosting all over one cookie. Place the second cookie on top of the first cookie and cover the second cookie with frosting. This trendy Instagram number cake tart isn’t hard but these tips will help you nail it the first time. Get organized. Choose how you’ll decorate your cream tart cake and set your embellishments aside in separate bowls. Because pretty frosting is stabilized whipped cream, it doesn’t hold for that long at room temperature, so you want to be ready to decorate and then pop the cake in the fridge before serving. Choose a template. 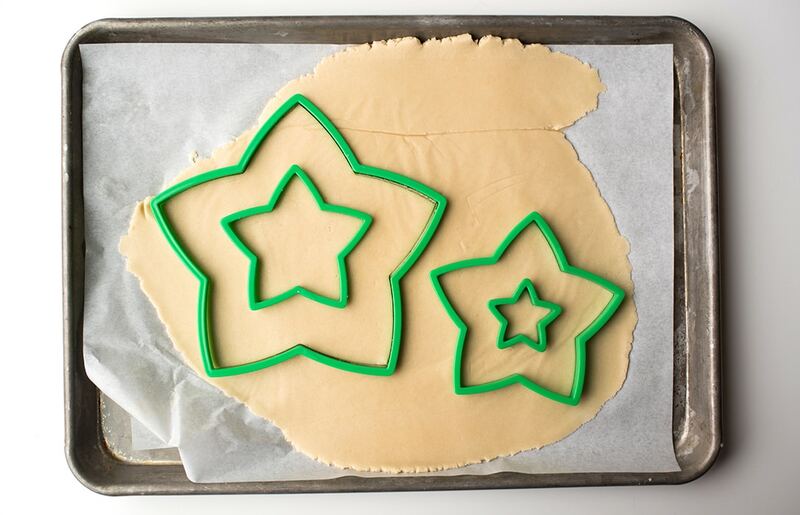 I used large star cookie cutters from a Christmas tree kit, but you can also hand draw a template. Or, if you’re like me and not artistically skilled in the slightest, look in google images for a stencil in the shape you want! Searching for “star stencil” will bring up a variety of images which you can print out and trace onto a piece of parchment. 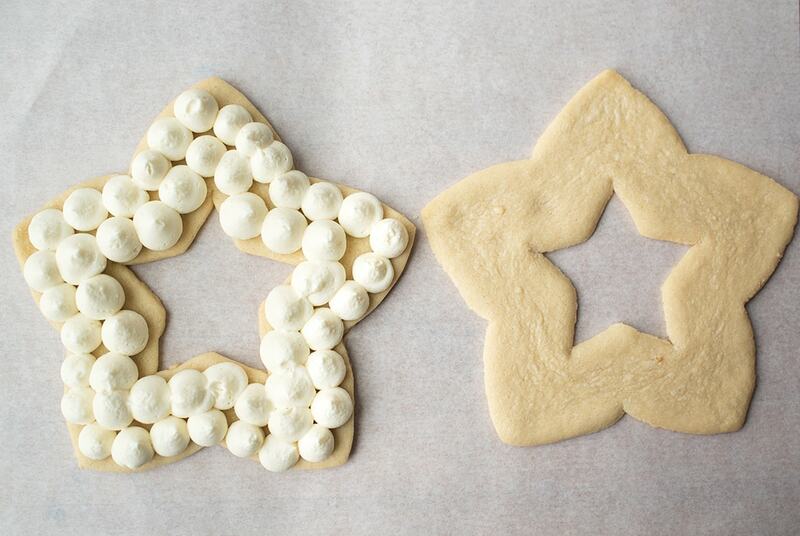 Cut it out, lie it on top of the sugar cookie dough, and cut around your shape with a knife. Don’t move the cookies before baking. Part of why the cream tart looks cool is because it’s made of two identical layers. Usually rolling out sugar cookies on a floured surface or parchment paper and then transferring them to the baking sheet is fine. Not here, because doing so will distort the shape of the cookies. I roll the cookies out to ¼” inch between two pieces of parchment, remove the top sheet, and then carefully lie the other sheet (with the cutout cookie) on the baking sheet and bake it until the edges are golden. Let the cookies cool completely. Impatience will result in melty frosting. Make enough frosting. The frosting amount listed below makes enough for one 8” star cream tart or two 5” tarts. The cookie amount makes enough for four 7” tarts or eight 5” tarts. That’s because if you choose to just make one tart, you can easily freeze the leftover dough. If you want to make four 7” tarts, double the frosting, pipe all of that, then make a second double batch. That’s it! Get creative with colors and designs and edible decorations. At the Kroger event, I used strawberries and blueberries, red and blue M&Ms, and roses. At home, I added Twizzlers and used these little star sprinkles I found in my sprinkle drawer. 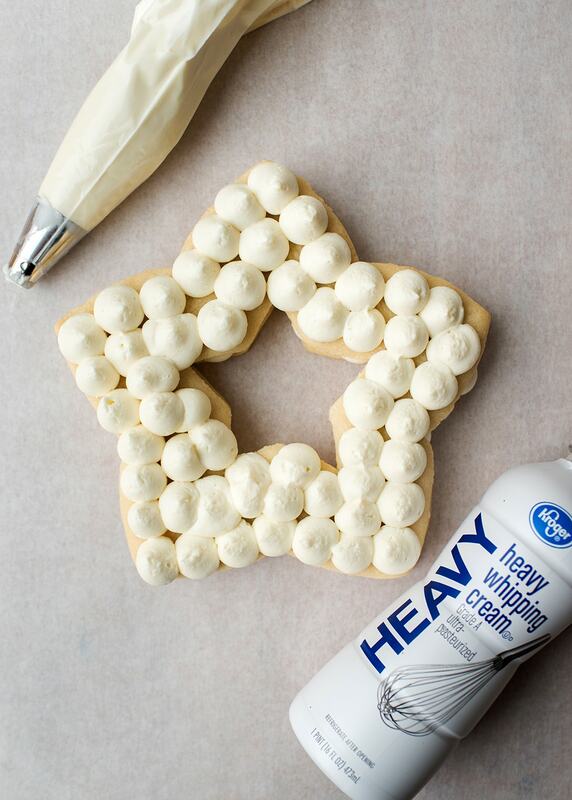 Learn how to make a star-shaped cream tart cake inspired by the number cakes on Instagram! Combine flour, baking powder, and salt in medium bowl. Set aside. Cream butter and sugar for 3 minutes using electric mixer until mixture is light and fluffy. Add egg to butter mixture and let combine for 30 seconds. Reduce speed and add flour. Mix until dough starts to come together into a ball. Divide dough in three equal balls and roll first ball between two layers of parchment paper until ¼” thick. Cut out desired matching shapes, rerolling scraps as needed. Press unused dough into discs, wrap in plastic, and transfer to freezer to be used for a future recipe. Transfer parchment with cutout cookies to baking sheet. Bake for 12 minutes or until edges of cookies are light golden brown. Remove from oven, place on wire rack, and let cookies cool completely. Beat cream cheese, heavy cream and sugar on high until mixture has thickened, about 4 minutes. Transfer to pastry bag fitted with round tip. Pipe frosting on the sugar cookie that will be the base. Pipe all the way around the edge, then go in slightly and go all the way around again. Repeat until the cookie is covered. 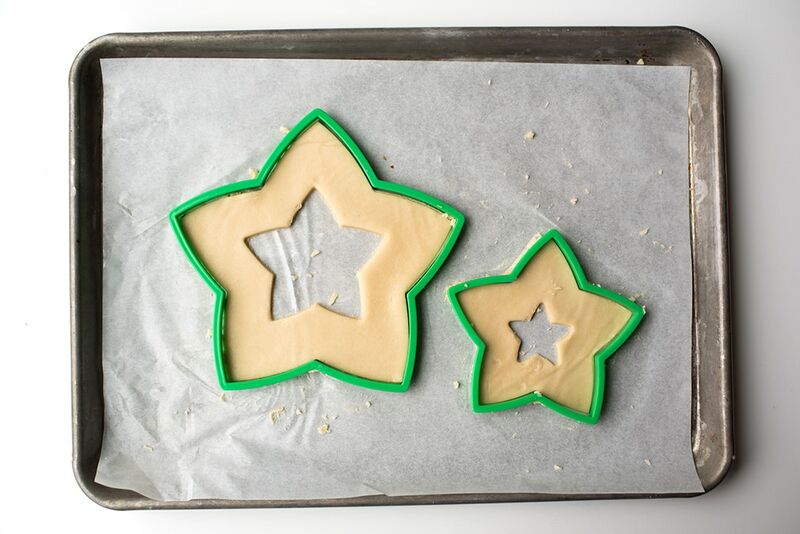 Place the matching sugar cookie gently on top. Pipe frosting on the top sugar cookie in the same way. The cookie cream tart is best enjoyed the same day it is made. If using fresh flowers but not serving the cake immediately, wait to place these on the cake until just before serving. This is gorgeous! I could see this being a crowd pleaser for summer parties! Thank you so much! It’s super easy to make and I think it would be. The cookies can be baked the day before but I’d probably make it the day of because otherwise the cookies absorb the cream frosting and it can get a little soft. What an adorable cake for 4th of July and beyond. Looks delicious and a great centerpiece as well. This is so BEAUTIFUL!! Seriously amazing! Perfect for upcoming 4th July!! Love it! Thank you. Definitely consider making the cookies ahead of time to save you time that day! This looks amazing! Definitely planning to make this for my family’s July 4 gathering! Oh my goodness this is the most beautiful star treat that I have ever seen. So much fun too great for a birthday party I think this is a showstopper. Love it!! I loved seeing how this was made. It is so gorgeous. Pinned for later.